Lowdown: A thorough analysis of the fallacies of American meritocracy. The first time I heard the word “meritocracy” it was in Alain de Botton’s Status Anxiety. 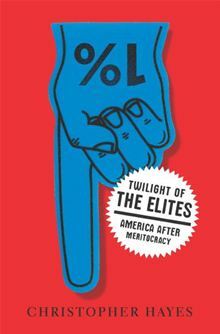 While de Botton looked at the concept from the individual’s point of view, Christopher Hayes’ Twilight of the Elites goes a step further and expands the scope: it is on the shortcomings of the meritocratic dream that is at the core of American psych that he pins the woes suffered by our societies in the post 9/11 decade. The core idea behind Twilight of the Elites is that the entire concept of a meritocracy stinks. For a start, the idea was dreamt up by a British author in an attempt to portray an ill fictional society; the fact it actually ended up inspiring American society is a cause for worry. Second, the very concept of meritocracy is undemocratic in the sense it advocates an agenda where certain people, those of merit, are superior to others; the only difference is that the superiority is determined by merit. Or is it? Hayes brings one example after the other to show, behind any reasonable doubt, that this is not the case. Perhaps the elites formed up on the basis of merit at the beginning, but as of that point the elites we put on top to rule us are mostly busy preserving and fortifying their position rather than acting as the true elite of merit we would sort of aspire to have. The results are there for all to see: the GFC brought the allegedly meritocratic elites to their knees, yet they managed to get away Scot free using our money; now they are back to doing exactly what they’ve done before. The rest of us, the majority, are starting to get the point: we lose trust in the institutions we are meant to rely on, no doubt helped by the likes of an Obama with his “yes we can” promises of change, yet an Obama that turned out to be more institutionalized than anyone could have imagined. We don’t like what we see, so we rebel: some of us don’t know what they’re doing so they rebel by preventing their children from receiving immunizations, others rebel through the Occupy movement. The beauty of Twilight of the Elites is the clarity and the gripping way in which its vision is portrayed. It is actually entertaining to follow through the unravelling thread of our society in this journey that Hayes is taking us through. Sadly, I agree with almost everything Hayes is saying, particularly his gripe with the way the education system is used (or rather, abused) by the elites. Perhaps the most compelling evidence in favor of Hayes’ vision is my own personal experience. Looking at my history, I never really questioned why I was at the privileged position where I could choose any high school and later any [Israeli] university to study at; I always thought it was because of my talents and the efforts I have made. Later on I tended to think the same way about my professional career: those who did not make it as well as I have were to blame for not making enough of an effort. It did not occurred to me that perhaps I was given certain opportunities that others were not as lucky to receive. Things changed when I hot a bout of unemployment, an experience that made me realize how close the abyss really is for each and every one of us. From that point and onwards I became an advocate for a society of equal outcomes, just as I became disgusted with seeing the way the elites are constantly making sure that ideal never materializes: you know we are all screwed when people justify public funding of Australian private schools by arguing that otherwise there won’t be enough places for everyone, to name but one example. And you can see the corruption of the elites ruling us everywhere you look: this weekend alone we were told the Premier of Victoria promised a local industrialist a whole new train line (see here). Can a normal, non elite member, even conceive the idea of a train line erected in their personal favour? Clearly, the meritocratic dream is sending not only the USA but the rest of the Western world as well on its downward spiral. Where Hayes and I disagree is on his vision for solving our problem, because I think Hayes is far too optimistic. It is clear the solution to this social crisis of trust in the very foundations of society can only come from the USA, but it is also clear American society is far too disintegrated to unite and address the problem. Hayes is arguing we should strive for a society where there is not only equal opportunity but equal outcomes as well, and I fully agree; Hayes is arguing we should strive for a more equal society with significantly lesser margins between social classes, and I fully agree; Hayes is arguing the best and easiest way to solve the problem is by raising taxes, and I fully agree. However, is one really able to imagine all the members of American non-elites, say the Occupy movement and Tea Partiers, uniting to enforce such a solution? There are too many chasms between these two extremes stemming from the world views at their very core. And with American society so deeply fragmented, it seems clear to me we are all destined to suffer much more at the hands of the elites before we are actually able to unite and properly make our way towards a more equal society. I do wholeheartedly agree with one of Hayes’ main points, though: this struggle to keep our society on track is an ongoing one to be forever fought; our disagreement is on how much further we need to go down our current deep before we start going up again. Then again, as Hayes doesn’t shy of pointing out, with global warming looming in the background, bidding our time may put us all in the brink of civilization’s worst disaster. No, I am no optimist when it comes to the future of mankind. Overall: An illuminating experience that manages to clarify a lot of the issues of our time and put them in perspective. An achievement worth 4 out of 5 stars.